… making iTunes Connect convenient. Managing screenshots with drag & drop. Updating localizations without waiting for page loads. Add sale price intervals via a convenient date picker. Jack makes presenting your iOS and OS X apps a breeze. It is a convenient frontend to the iTunes Connect Transporter and a powerful editor for your apps metadata. Manage screenshots with drag and drop, easily add pricing intervals, manage and localize your in-app-purchases. In addition to loading and editing the app metadata, it also loads the existing screenshots from iTunes Connect. Something that the Transporter doesn’t do. Jack loads all information about your apps and shows them in a convenient overview. Jack stores your account in your Keychain and does not send it anywhere but to iTunes Connect! 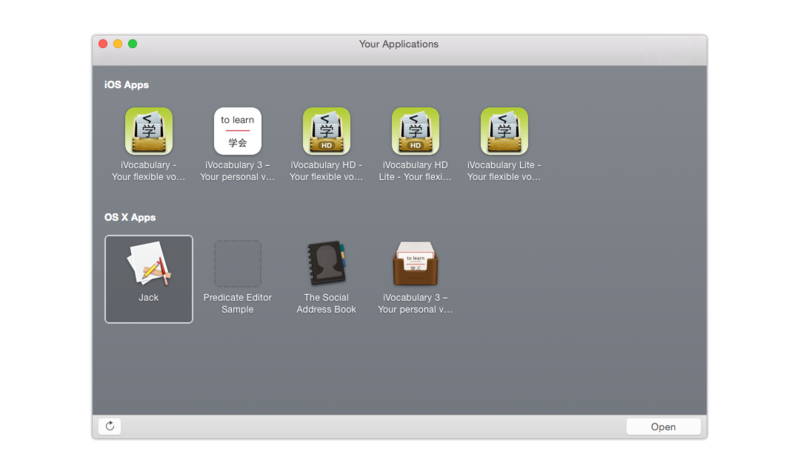 Compose the marketing texts for the app store like using a word editor and drag & drop the screenshots at their place. When you finished your app’s presentation, you upload it to iTunes Connect all at once … with just one click! 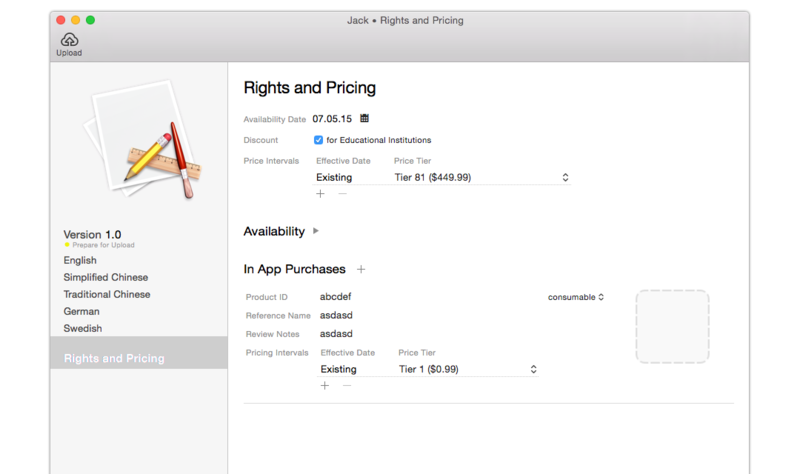 Managing pricing and in-app purchase on iTunes Connect is complicated and unintuitive. Jack makes that as easy as it can get. Choose a time period and the price and add that as a new pricing interval. Add in-app purchases with one click and localize them on the language pages. How do I load changes I made in iTunes Connect? Jack does no automatic syncing of the contents with iTunes Connect. The idea is to make all your changes offline in Jack and load it to iTunes Connect as soon as you want to publish it. You can (and sometimes you have to), however, re-load the content from iTunes Connect from the files menu. This needs to be done, as soon as you add a new version to an app. But be aware that Jack overwrites any changes you made locally! What if Jack produces wrong data with an upload? I use Jack with all my apps and tested it. 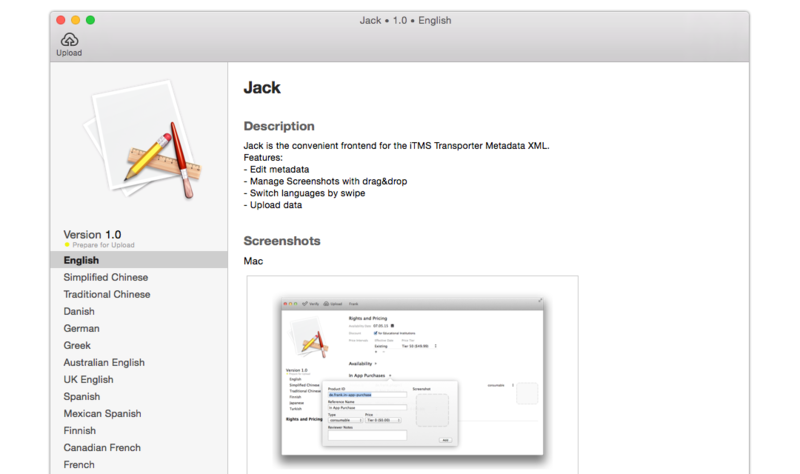 Also Jack uses the iTunes Connect Transporter tool to upload the metadata and screenshots. This tool checks your data and only accepts valid data. If there is, however, an error after an upload. You find a backup of your data inside the document packages Jack downloaded in ~/Library/Application Support/Jack/Documents/#ID.itmsp (where #ID is your document’s ID). I broke the content of one of my apps!! What now? If you didn’t already upload the content to iTunes Connect, you can just re-download an app from iTunes Connect. This overrides all changes in that app locally, though! For contacting me directly, you can send a mail using the following button and I will get back to you as soon as possible (applying German timezone and holidays). You can find release notes, issues and planed milestones on the support page on github.com.